Standard features include: Three controls (room thermostat, timer, combination bonnett control), blower and motor, fiberglass filters, two ash receptables. Available options: Conventional thermostat system, coal-trol digital thermostat system, domestic statinless steel hot water coil. The Keystoker 160,000 BTU double wall constructed Koker furnace has a 9" wide flat grate stoker and patented thermal heat exchanger. 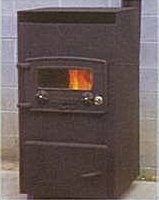 This popular furnace can be used as an add-on or used freestanding to heat a small home. It comes with an opening on the front (3 X 25) and an opening on the top (11X19) to distribute warm clean air into your home.